Every moment in Michael Hingson’s and Roselle’s lives seemed to lead up to this day. When one of four hijacked planes flew into the World Trade Center’s north tower on September 11, 2001, Michael Hingson, a district sales manager for a data protection and network security systems company, was sitting down for a meeting. His guide dog, Roselle, was at his feet. Paired for twenty-one months, man and dog spent that time forging a bond of trust, much like police partners who trust their lives to each other. Michael couldn’t see a thing, but he could hear the sounds of shattering glass, falling debris, and terrified people flooding around him and Roselle. However, Roselle sat calmly beside him. In that moment, Michael chose to trust Roselle’s judgment and not to panic. They were a team. 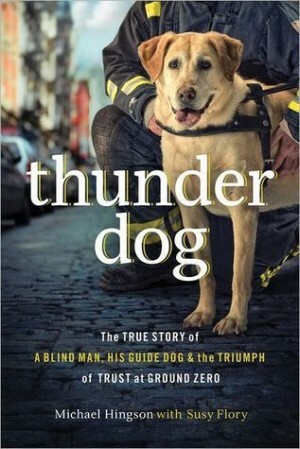 Thunder Dog is a story that will forever change your spirit and your perspective. It illuminates Hingson’s lifelong determination to achieve parity in a sighted world and how the rare trust between a man and his guide dog can inspire an unshakable faith in each one of us.